Mike Lieberman shares the tactics he uses at Square 2 Marketing to analyze client data and evaluate each stage of the funnel. The landscape of inbound marketing has changed significantly over the last few years, and Square 2 Marketing has not stood still. Mike Lieberman from Square 2 Marketing has seen it all since becoming the first HubSpot Diamond agency. He was practicing inbound marketing before thousands of agencies joined the HubSpot Partner Program. And while other agencies struggled to keep up with the rapidly changing tactics needed to stay one step ahead, Mike has consistently adapted his agency to new changes. 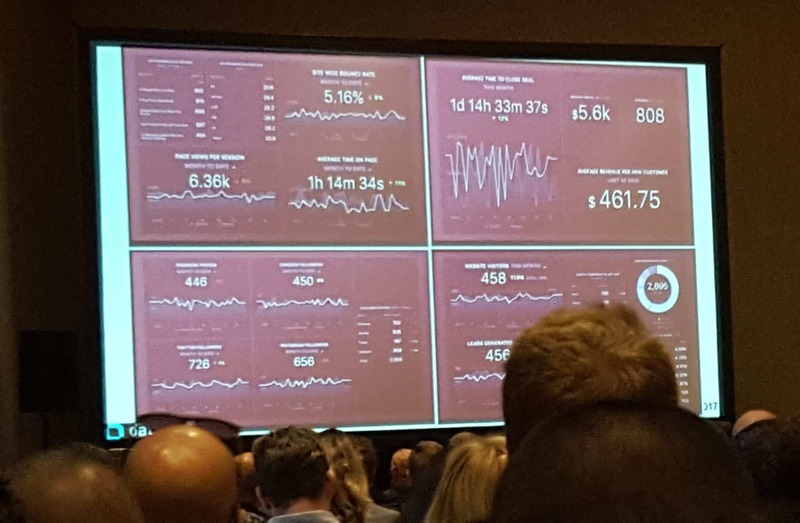 Since the subject matter of the talk was directed at high-achieving inbound marketers, you might expect that plenty of people in the room would raise their hand to show that they were ahead of the curve. But only about 10% did. Acting like artists, or seeing marketing as a process of completing works of art for a brand rather than generating leads. Copying everyone else and expecting the same results. Instead, Mike recommended that marketers should act like scientists. They should rigorously analyze each step of the funnel, and try a few experiments until they get positive results. Just like scientists, marketers should not be disappointed if their initial experiments do not work. That is part of the process. Instead, they should embrace the lessons and press on to test new campaigns. That is the only way to get to exceptional results. And, if you are an agency, you need to be able to communicate this attitude to the client to ensure that they understand the approach. Mike uses two separate tools to do that: the True Funnel tool and the Lead Generation tool. 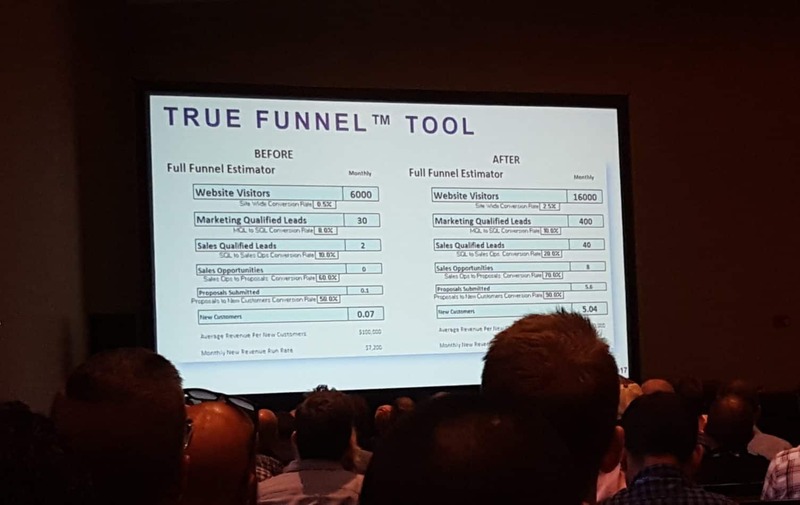 The True Funnel tool helps marketers understand the improvements they will need to make at every step of the funnel if they want to achieve their big goals. For example, if you are doing $5 million in revenue this year, and you want to do $10 million in revenue next year, you need improvements at every step. And, you need to anticipate churned customers. 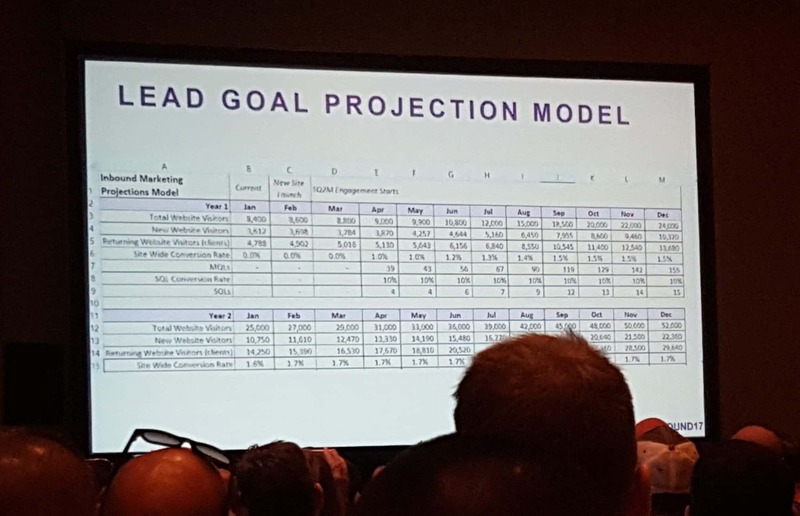 The Lead Goal Projection model follows the True Funnel tool. Square 2 uses this monthly breakdown to set expectations for the clients and themselves. They need to have a plan for results they need to deliver on a monthly basis so they stay on course for the annual goal. And, of course, they showed 4 Databoards that they use to track all this information in real-time! Mike then covered 4 specific stages, and the tactics you can use at each stage to improve your funnel. There are actually plenty of good prospects in the Unaware stage! They do not even know that a solution exists to their problems. In other words, they are likely not searching for solutions on Google. You need to disrupt their status quo and grab their attention. You probably have heard all of these tactics over and over again, so there is no point in listing them again. Mike recommended that you measure each one independently so you can better direct your efforts. The traditional linear funnel is dead. Now, prospects move throughout the funnel at will, and there are more opportunities for conversion than ever before. Prospects do not want personal guidance at every step. They want to move at their pace. So, you should have a variety of offers that support different types of conversion. This is a common point where marketers and salespeople get tripped up. They have not acclimated to this new reality, where buyers have many choices at any given time. A simple ‘Contact Us’ or ‘Book A Demo’ page will result in a 2% conversion rate. You should focus your sales offers around value. In one example, an industrial safety products company offered a 30-minute workplace safety consultation rather than a sales call. That will increase your conversion rate to about 10%.